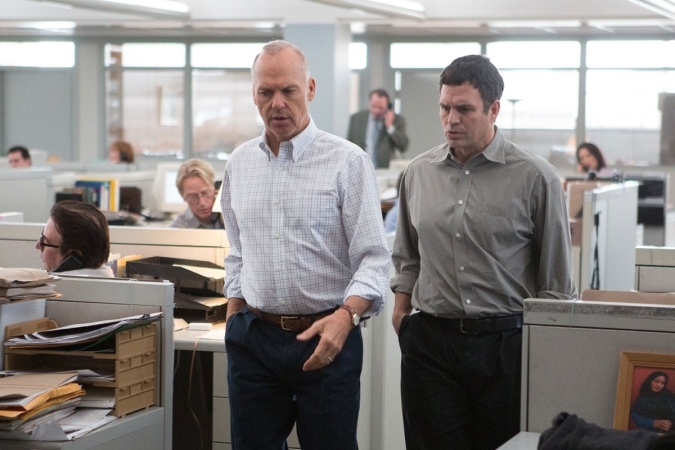 Tom McCarthy brings the journey of "The Boston Globe" as they covered one of the darkest stories in Boston's history to the big screen in his latest film "Spotlight". This year we've had some big contenders for "Best Screenplay" but "Spotlight" and its screenplay just might beat them all. McCarthy isn't afraid to bring the truth to light here, with material that's so gripping you cringe whenever the case at hand is mentioned. 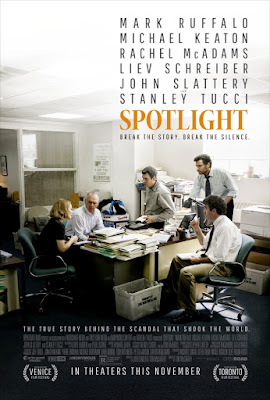 "Spotlight" also showcases an ensemble cast consisting of Mark Ruffalo, Michael Keaton, Rachel McAdams, Brian d'Arcy James, John Slattery, Live Schreiber, and Stanley Tucci as they play the members who brought the "Pulitzer Prize" winning story to light. The performances all around are solid but in particular Ruffalo's character shows the most potential in gaining any type of recognition with a very immersive performance. While cast members performances all compliment each other naturally it does seem as if everyone plays it safe instead of giving us that extra notch we need to say "Mesmerizing". Before digging deeper into the film its plot follows "The Boston Globe” as they stumble upon a story that’s been covered once before but was buried due to the story pertaining complications between priests, the church and children. 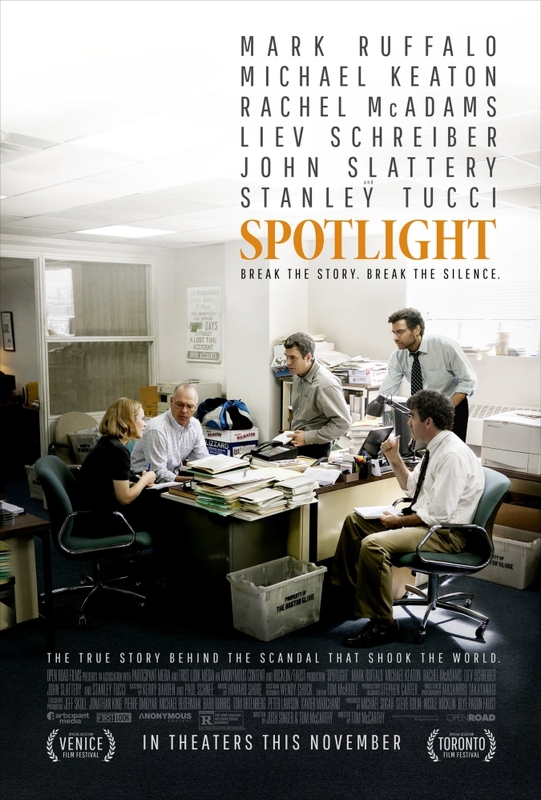 Ruffalo, Keaton, McAdams, and James are part of a special coverage team within "The Boston Globe" called "Spotlight" and are assigned by Live Schreiber to dig deep into the buried story and bring it to light with the full scope. The plot itself is not something original but since it’s based on actual events that occurred, the accuracy, adaptation, and execution are the big factors here. In my opinion McCarthy wrote a phenomenal screenplay for "Spotlight", sticking true to the actual events and not throwing so many Hollywood curve balls at us just for the sake of it being adapted. The directing style is hard to be seen due to how plain and straightforward the subject matter was. In my opinion McCarthy could have dressed up "Spotlight" a bit more but then again the more I think about it this is why I enjoyed it. "Spotlight" is a film that stands as an example that if you're just looking to tell an informative story you don't have to soak it in your own style, it can be straightforward and still execute brilliantly. I think that from a writers perspective "Spotlight" is well done but from a directors standpoint falls a bit flat on its pacing and thrills. The thrills for me were too spread out from each other, not happening as often as I needed to keep the casual moviegoer interested in the actual subject matter in between. Having said that I think "Spotlight" will be more welcomed by the aspiring writers of this generation than directors. Tom McCarthy did a fantastic job at bringing the magic he had done previously with Disney Pixar's "Up" and transferring that to "Spotlight". If you're the casual moviegoer who's interested in this movie because of the ensemble cast and the fact that the trailer basically weaves together the spaced out thrills in this 2 hour gem then just be aware before going in that "Spotlight" is a moderately paced ride, not a fast one. This year there’s heavy competition for McCarthy and I think "Spotlight" might not hold up in most categories. Overall I did enjoy "Spotlight" but I still had problems with it mainly its pacing and lack of proper direction, but this film is definitely not a waste of time if you're looking for a good time killer.